Our Thing benchmarks are a/ very old and b/ 90% about rough game numbers for the main stages of his evolution. We keep them because they are important numbers to have in mind, but they’re not profiles in the modern sense. The series goes #1 (lumpy Thing), #2 (classic Thing), #3 (spiky Thing), #4 (modern Thing). Real Name: Benjamin Jacob Grimm. Known Relatives: Daniel Grimm, Elsie Grimm (parents, deceased), Daniel Jacob Grimm (brother, deceased), Jacob “Jake” Grimm (uncle), Alyce Grimm (aunt, deceased), Petunia “Penny” Grimm (aunt), Franklin Benjamin Grimm (godson). Group Affiliation: Fantastic Four ; also an Avengers reservist. Former member of the Avengers West Coast, Thunderiders, UCWF and Yancy Street Gang. Base Of Operations: Four Freedom Plaza, NYC. 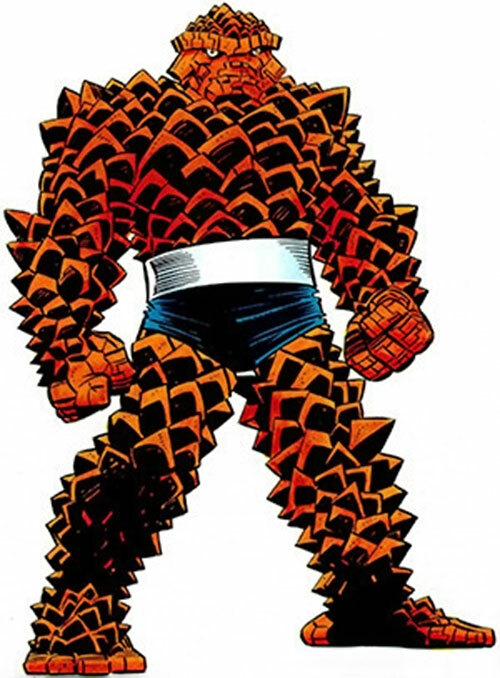 For a short time, the Thing mutated further to a heavier, spiky form which was much stronger and tougher than his normal state. This happens at the end of the Classic Thing period, so apply the personality notes for the Thing (classic) writeup. He’s less of a comical character, and even more confident than previously. He’s also more at ease with his body, and he does not feel depressed. It has a lot to do, of course, with the relationship he enjoyed with Ms. Marvel (Sharon Ventura) during this period. Conditional Soaking (Blunt), Expertise (Aircraft mechanics and maintenance), Headquarters (Expansive), Leadership, Popularity. Fantastic Four (High), Hero community (High, Powerful), Uatu the Watcher (Low). Public ID, Distinct Appearance, MPR (his density increase is high enough to prevent him from swimming). 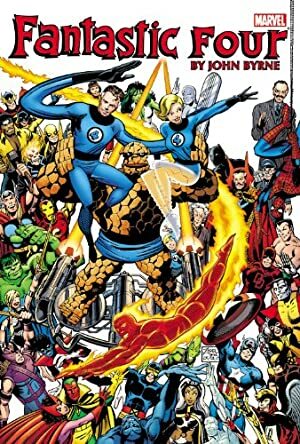 Benefit (Member of the Fantastic Four), Benefit 2 (Popularity – most civilians are automatically Favorable), Connected, Skill Mastery (Vehicles). Deception 1 (+3), Expertise (Aircraft Mechanisc and Maintenance) 7 (+9), Insight 5 (+8), Intimidation 2 (+5), Perception 5 (+8), Persuasion 3 (+5), Vehicles 2 (+6), Vehicles 8 (+14) (Limited – air and space only). Upholding the Good Underneath it all, Ben is a compassionate, self-sacrificing soul. Appearance Ben has an unusual and potentially startling appearance. Relationship During a period in this era, Alicia. 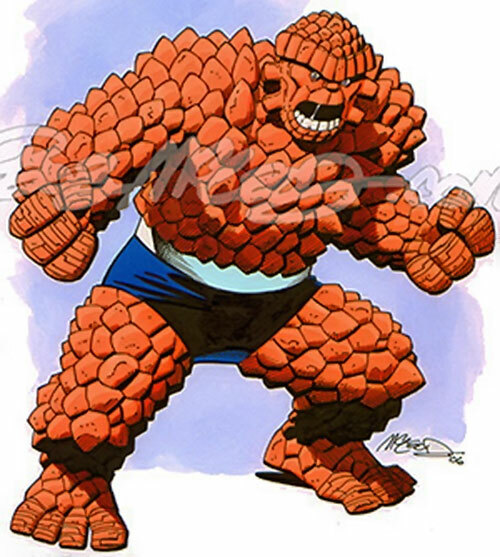 Public Identity Ben Grimm is a bona-fide celebrity, with all that entails. Density Ben is dense enough in this form that he cannot swim. Trade-off areas Attack & Effect PL 14, Dodge/Toughness PL 10, Parry/Toughness PL 14, Fort & Will PL 12. Point total 186. Abilities 90, Defences 18, Skills 15, Powers 43, Devices 0, Advantages 20. Equiv. PL 13. If using the optional, open-ended equivalencies, the Thing’s Strength is 20 and his Protection increases by 2. Drop his lifting-only Strength. Trade-off areas. Attack/Effect PL 16, Dodge/Toughness PL 11, Parry/Toughness PL 15, Fort/Will PL 12. Point total 194 Abilities 98, Defences 18, Skills 15, Powers 43, Advantages 20. Equiv. PL 13. By Sébastien Andrivet ; DCA stats by Pawsplay. Source of Character: Fantastic Four comics (Marvel Universe). Helper(s): Mark Ayen, Z, Angel, JKCarrier, Phil Dixon. Support the Future Foundation and writeups.org !